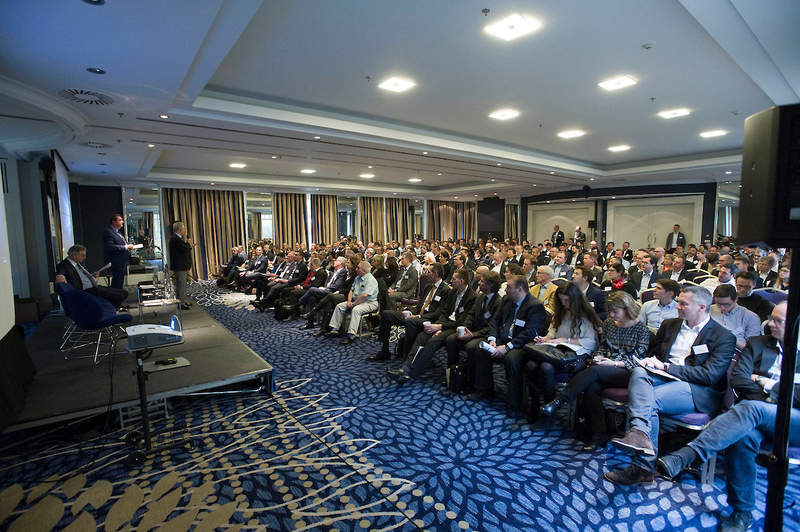 Sold-out Success: Petcore Europe Conference "EU Plastics Strategy 2.0"
On 6 and 7 February, more than 280 delegates from the entire PET value chain from Europe and beyond gathered in the Renaissance Brussels Hotel, adjacent to the European Parliament Area of Brussels. Under the theme “EU Plastics Strategy 2.0 - Taking the PET industry to the next step”, the complete PET industry sectorshared perspectives and strategies for a succesful and even more circular future. From PET resin producers, masterbatch producers, packaging designers and manufacturers, equipment manufacturers, label producers to major brand owners, EPR schemes, waste management organisations, recyclers, waste sorting and recycling machinery manufacturers - the entire value chain was represented. Additionally, speakers and participants from the European Commission (DG GROW), the European Parlimanet as well as ICIS shared their thoughts on the PET market as well as the plastics industry in the European Circular Economy. "Petcore Europe represents the entire PET value chain since 1993. The strength of the organisation is the engagement of over 65 participating members, who are actively participating in working groups and projects", emphasised Christian Crepet, Executive Director of Petcore Europe, when opening the conference. "This engagement of all members, in combination with Petcore Europe's commitment to recyclability and circularity, is a great value for the entire industry. Petcore Europe's growth over the past years is remarkable, in 2018 we could welcome 17 new members, in the first month of 2019, another 10 companies joined the association", added Stephen Short, newly elected President of Petcore Europe. The focus of the first day was to set the stage of the present PET market status, collection and recycling rates. Susan Mair from ICIS gave an overview of the PET collection and recycling rates for 2017 as well as the key drivers of the market. According to ICIS "there is an under utilised PET recycling capacity of 300.000 tonnes due to a lack of material coming from collection processes"
Following the market assessment by ICIS, Alessandra Funcia, Head of Sales and Marketing Sukano, presented PETCore Europe’s programs of tow major working groups: PET Thermoforms and Opaque & Difficult to recycle PET containers. After the introduction, experts from the PET value chain gave presentations detailing the market overview. Steve Scott, Chairman of the Committee of PET Manufacturers Europe (CPME), addressed the PET market from the perspectives of the European PET Producers perspective. He stressed the importance of chemical or back-to-monomer recycling and the essential role PET producers will play to achieve it. Marc De Voogd, General Manager of Alpla France and Iberia, gave a converter’s vision for the future in his presentation.. Accordingly the demand for post-consumer recycled PET will increase drastically by 2025 which is the challenge for the whole industry. Casper van den Dungen, Plastics Recyclers Europe (PRE) in the last presentation of this section gave an outlook on recycled PET up until 2030. The main points are firstly the Single Use Plastics Directive (SUP) will be the driver for the PET value developments and secondly the PET bottle collection is required to improve considerably to reach the 77% collection target in 2025. Casper concluded the presentation with a call to the recycling industry: "Use the momentum to create the difference." At the end of the first conference day, a cocktail hour plus dinner facilitated a period of networking for the participants to exchange views on the conference content and the overall PET business. The second day of the conference continued where day one ended with a conference room full of representatives from the PET value chain - ready for the morning session focusing on "EU Plastics Strategy 2.0". A significant highlight of the conference was the presentation of the European Strategy for Plastics in the circular economy by Laure Baillargeon from the European Commission - DG GROW. She gave insights in the newly launched Circular Plastics Alliance and stressed the fact that the European Commission is fully supportive of the plastics industry in delivering on the collection and reuse rates of plastics. It was also emphasised that the whole aspect of Life Cycle Analysis would be compared in decision making for preferred packaging alternatives. In summary, Christian Crépet, Executive Director of Petcore Europe, stressed the importance of collaboration between the industry and policy makers and congratulated DG GROW for the Circular Plastics Alliance initiative. Samuele Furfari (ULB) followed with a state-of-the-art presentation on the changing world of energy. According to the professor, who can look back at a long career in the European Commission where he implemented various energy policies and sustainable development, there is no new energy paradigm. The often predicted end of oil is not apparent. Mike Neal on behalf of CPME, followed Samuele Furfari with an enlightening presentation concerning the regulatory perspective on the PET value chain.. In the afternoon session of day two, the focus shifted to trends and solutions in the PET post-consumer collection. First, Gian de Belder, Petcore Europe ODR Working Group Chairman, from Procter & Gamble presented the Holy Grail project on markers and digital watermarks. Gian also gave an interesting overview of the five pillars for a circular economy: design for recycling, access to collection, participation/education, separation and product innovation. Gian was followed by Clarissa Morawski from Reloop, who gave an update about the current developments in deposit collection. Clarissa mentioned that Scotland, Malta, Portugal, Turkey, Romania, Slovakia and England are currently actively working on the implementation of Deposit Return Systems. The last presentation of the collection focused session was held by An Vossen from plarebel and focused on the Belgian PET collection system. According to An, Belgium plans to achieve 90 % of PET collection with curbside collection and improved sorting. Three presentations focusing on collection and sorting were followed by four presentations about trends in PET trays, textile and ODR recycling. Paolo Glerean (Aliplast) gave an insight in Petcore Europe's PET Thermoforms Recycling Working Group. Paolo stressed the fact that chemical recycling on the one hand, and regional value chain alliances between packaging producers, recyclers and EPR schemes on the other hand, work synergistically to make PET trays truly circular. Paolo was followed by Karla Magruder from Fabrikology who presented the efforts of the textile industry to make polyester circular. With his second presentation of the day, Gian de Belder presented the work of Petcore Europe's ODR Working Group in detail. Gian gave a summary of the sustainable sleeve and label workshop that Petcore Europe organized in October 2018. An important highlight of his presentation was the announcement of a 3-year temporary endorsement for perforated sleeves on Household and Personal Care (HPC) PET bottles by the European PET Bottle Platform. Following on, Johannes Burghaus, an associate of Gian at Procter & Gamble, shared an update from the PET Aerosol Recycling Special Industry Group that Petcore Europe and FEA are running in collaboration to conclude the session. Fabrizio Di Gregorio from PRE proceeded with a presentation on design for recycling. He presented RecyClass, an online tool that ranks the recyclability of a plastic package, as well as other Design for Recycling Guidelines such as protocols by European PET Bottle Platform (EPBP) and Petcore Europe PET Thermforms Recycling Working Group. The last session of this year's Petcore Europe Conference focused on chemical recycling which was generally seen as one of the most important long-term solutions to make PET even more circular. Wim Hoenderdaal from Indorama Ventures Europe kicked-off the session with a general overview and stressed the following points: Chemical recycling will not replace but complement mechanical recycling and will facilitate the recycling of PET thermoforms, opaque bottles and other difficult to recycle PET products. After Wim's introduction, Martin Stephan from Carbios, Marco Brons from Cumapol, Frederic Favre from IFP Energies Nouvelles and Nelson Switzer from Loop Industries presented their companies' chemical recycling projects in detail and answered the questions from the audience in a panel debate to end a highly successful conference. To view the conference photos please vist our press room. The next Petcore Europe Conference will take place in the first quarter of 2020. The exact date and place will be announced in the second half of 2019. Copyright © 2019 petcore-europe.org. All Rights Reserved. Design and realised by www.abc-site.com.